It’s April, so I shouldn’t be blogging about winter, right? Well, it snowed at least 5 inches yesterday, and the forecast calls for another 5 inches tonight. This inspires me to go back to some pictures from my winter wardrobe, which I guess I can’t put away yet, and blog. Winter is a time to bundle up, layer up. Sweatshirts, sweatpants, turtlenecks, scarves, beanies, gloves, coats, boots, snowshoes….It’s also a time to bedazzle. My favorite way to do this is by adding some bling close to my face. Rhinestone brooches and chunky, bold faux gemstone jewelry come into play to create a bright look. 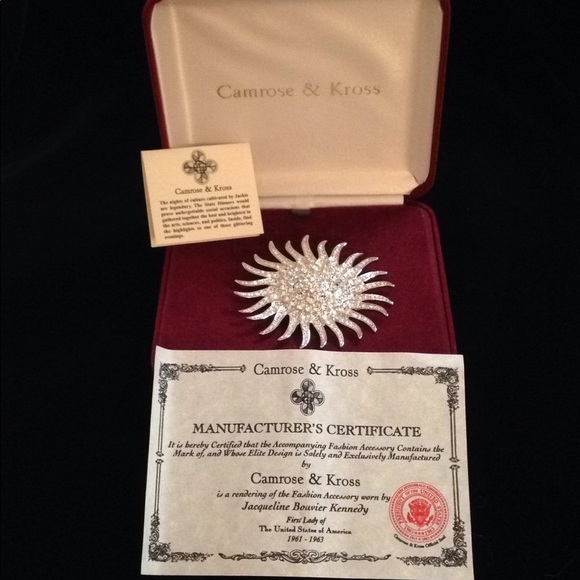 The Jackie Kennedy brooch by Camrose & Kross. This line of jewelry includes replicas of brooches, necklaces, earrings, and bracelets worn by the First Lady. Each item is packaged in a lovely maroon velvet box and comes with a certificate. Faaaancy. See the image below for one of pieces sold on Poshmark.com. I don’t own that brooch, but I did receive a different one as a gift from my mom. She found the one shown below in an antique store in Hallowell, Maine. As you can see, I added it to my cowl neck sweater. Instead of putting it on my shoulder or upper chest, which is what a lot of people do with brooches on sweaters, I took advantage of the giant neck of this sweater. Look at me being all presidential. 2. The gigantic faux gemstone choker. I have a lot of necklaces with gigantic beads. I have some with a multitude of smaller pieces. Then one day my mom (yup, her again) gave me this necklace. See my previous blog post. I have this same shirt in black. I also blogged about this on my Wix site. This necklace almost feels like a crest. It’s not any particular symbol. Not a butterfly. Not a phoenix (well, maybe). It has a variety of gem colors and a gold-plated and velvety rope chain (which you cannot see here because I chose to wear my collar over the chain). Pro-tip 1: these necklaces are heavy, so think about that when you wear one. If you wear it lower on your chest and you bend over, you will get a polite smack in the face by your necklace. Pro-tip 2: the backsides of these necklaces can be scratchy/sharp/cold on your skin. I like to wear them on top of shirts, rather than on bare skin. Well, now you know how to add some winter bling to your sweater wardrobe. Hopefully we can put those big sweaters away soon. Hey, April, stop being such a wintry brat!